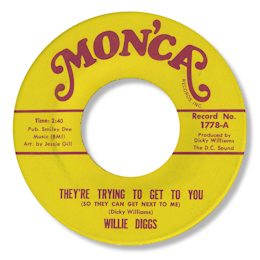 They’re Trying To Get To You is the only 45 I know by Willie Diggs, but it certainly is one worth knowing. After a gentle spoken introduction he takes his time delivering a stern admonition to his lady friend – note the way he delays his phrasing to such good effect. The horn charts by Jessie Gill are particularly fine. The song was written and produced by that underrated star of Washington DC music Dicky Williams. No doubt he’s the sensitive pianist here as well. Note ~ Could Willie be related to Jimmy Diggs, one of the Knight Brothers who came from Washington to Chicago to record so many fine tracks for Chess?